Frank Gehry?€™s Walt Disney Concert Hall ?€“ L.A.?€™s Phantom Menace. There doesn’t seem to be that much going on in LA this summer-?€”other than the budget disaster, international conflict, and the parade of ridiculous stars and celebrities trying to push out their name by forever running, or threatening, to run for governor. In a stagnant economy terrified of false starts and empty promises but eager for any sure-fire boost for the system, the easiest things to embrace are familiar concepts that we already know and love. Hollywood is, of course, the best at re-hashing: Terminator 4, Legally Blonde 2, Freddy vs. Jason, American Pie 3, X-Men 2, and Spy Kids 3 are all new again this summer. But this strategy doesn’t stop with Hollywood or with politics, it seems to be an age of prequels, sequels, and badly done remakes all around, in architecture as well as the movies, and the few good buildings that could be built are passed over for the easy win and the definite rental. Of all these big-budget disappointments though, the most hyped and the most disappointing is definitely Frank Gehry’s not-so-new Disney Concert Hall. Located in Bunker Hill as Venue #4 of the Music Center, the Disney Concert Hall succeeds the Dorothy Chandler Pavilion (Venue #3) and aims to tries to inject a little bit of glitz and razzle-dazzle into downtown’s decidedly staid corporate sprawl. The Disney Concert Hall is not necessarily a bad building, just like the Matrix 2 is not necessarily a bad movie. They are both visually and technologically impressive enough to notice and are still hip enough to seem like part of some fading Global trend. But they aren’t remarkable, or especially challenging works, either. When will directors and architects learn that special effects and computer skills do not tell a decent story on their own? Once the buzz fades away, and every last person has had a chance to giggle, I think we will all realize they are actually pretty boring and disappointingly familiar works. Hardly making sublime or autonomous forms like he did at Bilbao, Gehry’s more recent projects like the Disney Concert Hall and Music Experience turn back to the familiar elements and easily recognized signifiers of a pre-determined corporate aesthetic. There are too many material connections and too many glass and steel curtain walls in the building. They make the steel forms that seemed like radical architecture in Bilbao look more like decorative afterthoughts and tacked on accessories. Gehryfilm has turned the once innovative and unique concert hall into a poorly-conceived postmodern remake of the typical office building. (Only made more banal and more tragic because of it’s inability to define itself against the media frenzy and more irritating because of all the knee-jerk claims that it is extraordinary, shocking, and new.) The strategy is all peeling fa?§ade and little structuring concept. Every time the building tries to set off into the direction of something known loosely as a plot, a twist is thrown in to balance everything back into a Disney-owned mud-pie of PG rated fun. Everything that made the Concert Hall seem fresh and innovative a decade ago now looks formulaic and stale. It is only a matter of time before the current rush of excitement generated by the buildings’ completion will fade away and move elsewhere. 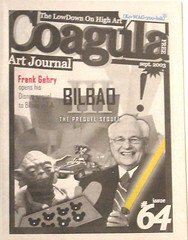 The time for the avant-garde project at Bilbao is over. It couldn’t last forever. Now, it is either time for another striking (and unlikely) innovation or for a maturation and refinement of Gehry’s vocabulary into a real language with both variety and substance. Only a master could undercut his previous efforts so deftly with a profusion of copies and unremarkable variations. Guggenheim Bilbao was a triumph, a brilliant piece of architecture worthy of all the claim and attention it has received and earned. It is a clear articulation of forms with deliberate and consistent detailing that is self-referential, contextually dynamic, and worth every penny spent. I am sure that the Hall’s auditorium will work well and that the Philharmonic will sound better than ever, and that once the spotlights are on, everything will glitter just fine for the television audience. But that is not enough to ask of a landmark building. We have to live with this one for a very long time, and we deserved better. We have to want to watch the spectacle over and over, long after its novelty has faded. Slickness and novelty only work once in architecture. After that, you are only left with the details, construction, and organization of the design itself. One can only assume then, that this is yet another of those fading white dwarfs of the postmodern era, a marketing-based signature aesthetic that simply refuses to die. If it’s Gehry, it has to be good, and if it’s good every city should have one (I mean, only if you’ve already got a Meier or two). There was a moment when Gehry’s project was visionary. The unaffordable Italian Limestone was just so seductive and ridiculous that it could have been butter. The forms were fresh and innovative and just having them made everything seem worthwhile. You didn’t have to look at it too closely because you were just glad someone was out there doing it. Now however, I really wish he’d just stop. LA’s cultural institutions shouldn’t look like those in Spain, and we don’t need to follow trends well established in Seattle, Washington or Biloxi, Mississippi. For a brief moment, Los Angeles was almost the center of Global architecture. (Do you remember when Metropolis dedicated its cover to the Gehry masterpiece that should have been built?) Now, however, the dream feels like an afterthought. Within the course of a few short years, the forms have become all too familiar and accessible. The terror Disney once felt at their purported expense has now faded into the promise of a guaranteed corporate return (it seems to be Miss Disney herself that insisted on covering the fa?§ades with Steel to be more like Bilbao instead of Limestone which would have been more, like, amazing). The once noble idea which caused such a ruckus in city hall now seems more like an apology and an excuse, a California Adventure not really worth taking except for the fact that you can purchase beer while you are there babysitting the kids. So it is business as usual for Disney, yet another building for Gehry, and a lost opportunity for Los Angeles.